What costs are relevant when determining how many pizzas a month Zume Pizza must sell to break even? Zume Pizza uses a combination of robots, artificial intelligence (AI), and GPS in its food trucks to deliver pizzas to customers’ houses just as the pizza is finished baking. Pizzas are actually prepared and baked in the Zume pizza truck by an employee assisted by robots. Zume Pizza started operations in April 2016 and is currently selling about 250 pizzas per day. The pizza delivery process starts with a customer using Zume Pizza’s app to order pizza. The pizza combinations offered by Zume have been derived by analyzing customer data to offer several popular options. These preset combination recipes are programmed into Zume’s computers, so that its robots can build and bake the pizzas efficiently. All pizza preparation and baking happens in the Zume pizza truck. Once the customer orders a pizza, a worker in the Zume food truck will toss the dough, cut the vegetables, and put on toppings. A robot will put on the pizza sauce. Each Zume pizza truck has 56 pizza ovens, which are each individually connected to the order system and the truck’s GPS. A robot will put the pizza into the designated oven exactly four minutes before the truck reaches the customer’s house. 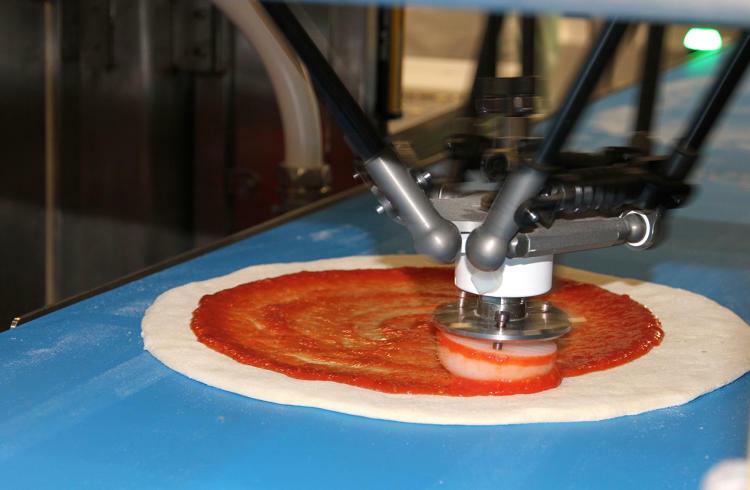 A worker will pull out the pizza when it is finished and place it into the cutter, where a robot will cut the pizza. The pizza is boxed and the pizza is delivered to the customer’s door, all within a few minutes of finishing baking. Eventually, Zume’s owners hope to use a robot to remove pizzas from the oven as well. Assume that average selling price per pizza is about $18. To follow are estimates of costs that might be incurred by Zume Pizza in its pizza business. From the list above, what costs would you classify as variable with respect to the cost of a Zume pizza? Are there any other variable costs you could envision that Zume might incur per pizza? Explain. From the list above, what costs would you classify as fixed with respect to the cost of a Zume pizza? Are there any other fixed costs you could envision that Zume might incur in its pizza business? Explain. What costs from the list and any costs you thought of for Questions #1 and #2 above would you use to calculate the break even number of pizzas that Zume Pizza must sell per day? Why did you included these costs? Calculate the break even number of pizzas. Given your answer for the current break even number of pizzas, calculate Zume’s margin of safety in number of pizzas (if any margin of safety exists.) What does this margin of safety mean? For a Zume Pizza delivery truck that uses a combination of robots, AI, and GPS in pizza preparation and delivery, what will be capitalized versus expensed? How long is the operating cycle of Williamette Valley Vineyards? Hi Wendy. Am I looking at this wrong or are the variable costs (ingredients, fuel, supplies, direct labor 6+3+1+5) equal to the sales price of $15? Thanks. Thanks for the quick reply. I thought that might be the case, so I’m changing the sale price to $18. That will make it reasonable for my class today! I appreciate your response. I already changed it to $18 – that was a pure typo on my part:-) Thanks for the heads up. Everything has been corrected.